On October 28, 1963, one of the most tuneful and delightful off-Broadway musicals opened at the Maidman Playhouse (later the John Houseman). It was called The Streets of New York and it captivated audiences and critics alike. The reviews were stellar, with Newsweek calling it, “The brightest musical of this season and maybe next, with a lilting score which often engages the ear with a contrapuntal complexity Broadway musicals never dare.” The book and lyrics were by Barry Alan Grael, who was, at the time, also an up-and-coming actor. The score was by Richard B. Chodosh, who’d been trying to break into musical theater all during the 1950s. They began working on the show in 1959. The company made a cast album in April of 1964, but it was a very hard to find LP, even then. The show served as a launching pad for director Joseph Hardy, who would go on to helm such plays and musicals as Play It Again, Sam (starring and written by Woody Allen), You’re a Good Man, Charlie Brown, Child’s Play, Gigi, and Romantic Comedy. Choreographer Neal Kenyon would go on to another huge off-Broadway success as director and choreographer of Dames at Sea. Actor Ralston Hill would go on to memorably play Charles Thomson in the musical 1776 on Broadway and then in the film version, and David Cryer would also go on to do 1776 on Broadway, as well as Phantom of the Opera and Evita, as well as appearing in several well-known films. And, most interestingly, the show’s standbys included some folks who’d go onto have rather significant careers: Julia Migenes and John Shuck. Today, The Streets of New York is pretty much a “forgotten musical” but it shouldn’t be. The score is tuneful and appealing, and the book is witty and clever. The cast album was released on CD in 1995. That CD has been long out of print. The original recording was done hastily and not very well, and it was not especially well mastered on top of that, so it’s a pleasure to revisit this wonderful score and to help the sound as much as we could, thanks to mastering engineer James Nelson. 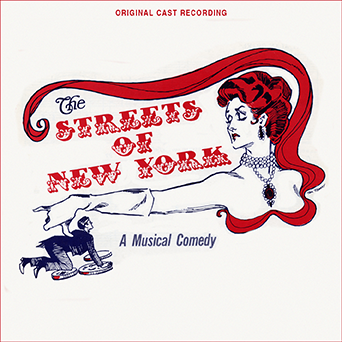 THE STREETS OF NEW YORK is limited to 500 copies only and priced at $19.98, plus shipping. This is a PRE-ORDER – CDs will ship by the second week of May, but never fear, we’ve actually been averaging three to five weeks early in terms of shipping ahead of the official ship date. Also note that your PayPal receipt is the only receipt you get – we don’t send out confirmations beyond that. Where Can the Rich and Poor Be Friends?